Ready To Ship: Between Apr 21st and Apr 23rd. HURRY! - Only 1 left! On this DVD, you'll learn a host of miracles that can be performed with an ordinary length of rope. An no complicated sleight of hand is required! After watching this DVD, you'll be able to make magic with rope just about any time and anywhere. With DVD technology, these tricks are extremely easy to learn. By freezing frames, jumping to specific performances and explanations, mastering these tricks becomes elementary for everyone. Cut and restore a rope! Make a rope penetrate through your neck or body! Cause a knot to simply vanish off a rope that has been cut and tied back together! See into the future by having the number of knots a spectator selects appear on a rope! 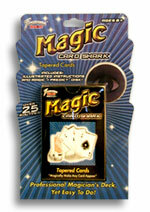 This product was added to our catalog on Friday 27 May, 2005.